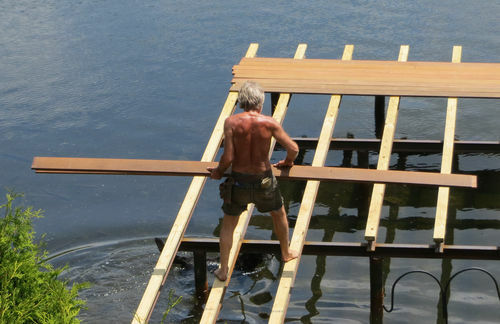 ...and hired a local dock contractor to fabricate and install the iron substructure. The substructure is 4” diameter pipe driven into the lake bottom, with a grid of 3” I beams welded to the pipe. The pipe is filled with concrete. I drilled a lot of 5/16” holes in the top of the I beams, and then sistered 2×4 pressure treated to the top of the I beams…clamping, and bolting from below with 1/4”x1.5” galvanized bolts. I worked from my dingy (when I could) because the water was still chill. After I finished with the sistering, I drove about an hour north to Bristol Valley Hardwoods, and picked up the Ipe for my dock decking. I needed about 45- 12’ 1×6, so it took 2 trips with my old Subaru Forester, to haul it back to the lake. Then I just laid down the Ipe like it was a deck…running the boards wild on both sides, and trimming them afterwards. I had to add some bling…a ladder, a bench, some umbrellas, boat cleats, etc. I didn’t get around to sanding and sealing it (got lazy)...but I sealed the ends of the Ipe with penofin. I’ll finish it up in the spring. Great timing for your post, Steve. With the storm of the century looming, it’s nice to think that better days are ahead. Beautiful design, location, and workmanship … and I love your dog! 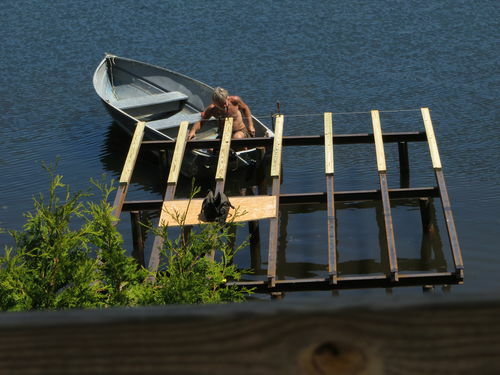 That is a classy looking dock with the ipe! Very contemporary feel to it. Gorgeous structure, and functional too. Curious how much the ipe cost in total. Super! That’s gotta be hard place to leave. Beautiful. The deck is incredible. Sure to be there for another generation or so. I hope you enjoy it for many, many years. degoose…I ran a Celsius to F conversion…that’s 104 degrees!!! We have another snow storm coming tonight. I needed something like 45 – 12’ 1×6. I remember that it was around $2300. 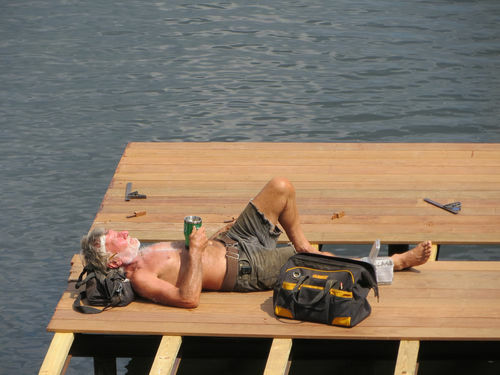 I’ve been building Ipe decks for about 15 years, and I can’t tell you how many times I told clients…”buy the best, and only cry once”...so when it came time to deck off the dock, I just had to take my own advice. 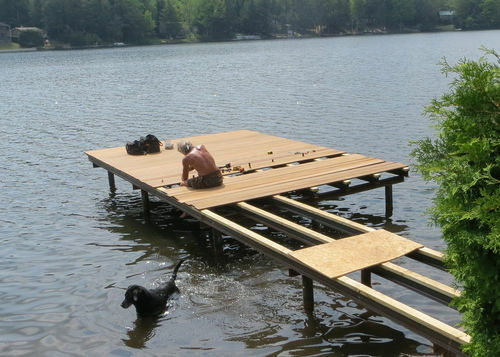 It’s a forever dock for me, and other cottage owners have approached me about doing their docks. That dock ain’t going anywhere! 4” steel concrete-filled tubes – wow! What’s the matter didn’t want to drive them into the bedrock? :) Nice job! Absolutely beautiful dock. Good thing you built it while youʻre still young. That ipe has got to weigh a lot. Good job. Thanks for sharing. Great pictures. Dinger…This lake freezes over, and likes to shift every dock to the northeast. I am hoping that it won’t move my dock too much each year. I won’t know until May, when I go back. I bungeed a 2’ aluminum level to one of the 4” pipes, so that I can judge the movement over the first winter. What a great project for all to enjoy, especially with the envious neighbors. 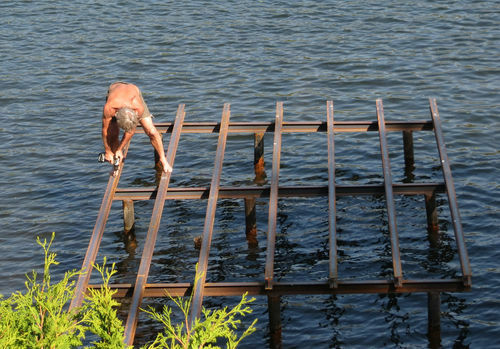 I think you just found a new summer job at the lake away from the city.